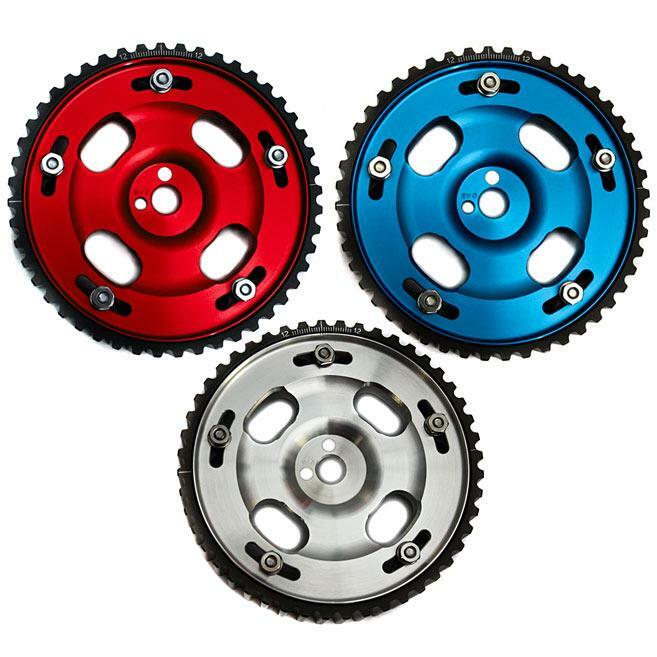 Fidanza cam gears are designed to tighter tolerances than factory OE gears and are precision CNC machined from high grade 6061 T6 aluminum for exact fitment and highest quality. Our design using stainless steel socket head studs secured with locking nuts and washers from the front side of the gear allows for easier, quicker adjustability. Stainless steel studs are threaded through the back of the outer gear, which the inner is placed into and fastened with stainless steel nuts and lock washers. This design delivers optimal function and strength by allowing more torque to be used to secure the inner and outer gear sections without risk of stretching aluminum threads. Outer gear teeth are beveled for increased belt life and hard anodized coated for better durability.